GH3D-383 | Size: 150 ml / 5 fl.oz. 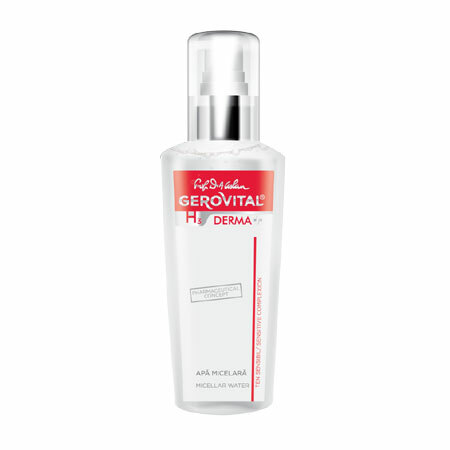 The Gerovital H3 Derma+ Micellar Water is designed at a pH level close to the natural tear with gentle cleaning agents that spare the protective barrier of the skin, gently cleanses while observing the skin's natural balance. Cleans and removes make-up perfectly on the face and eye contour. Skin cleansing and purification are achieved by associating surfactants without ocular irritation potential, which decrease the surface tension of lotion, ensuring an even distribution during application. They form molecular, spherical structures, that attract and secure the sebum oil particles, but also the makeup debris or others impurities. It contains Neutrazen®, a biomimetic peptide that controls and reduces the inflammatory process in the skin, but also its undesirable consequences, such as redness or pain. Apply in the morning and evening, on a cosmetic pad used to remove make-up, impurities with delicate movements. INGREDIENTS: AQUA, GLYCERIN, PENTYLENE GLYCOL, SODIUM COCOAMPHOACETATE, BUTYLENE GLYCOL, DEXTRAN,PALMITOYL TRIPEPTIDE-8, POLYAMINOPROPYL BIGUANIDE, CITIRC ACID, SODIUM CHLORIDE, PARFUM.